Find the latest Apple iPhone deals with our easy to use comparison tool. Looking for a top end iPhone but don't know who's going to give you the best deal? Then check out the TigerMobiles.com awesome range of deals on all new iPhones. With so many operators offering iPhone as part of incentive deals, you need to make sure you're getting the best offer possible. And that's where we come in. Just check out our easy to use comparison tool below, and you'll be sure to get the best deal! The very first iPhone was released in 2007 by Apple, and it immediately changed the way we looked at mobile technology. Since then, Apple have released at least one new iPhone a year, retiring older models as they go. iPhones are renowned for being stylish, with a great build quality and high-end specs. They’re also the best selling phone line on the market, and frequently top best seller lists with mobile operators. We’re currently in the twelfth generation of iPhones, but because Apple regularly retires older models there are currently seven iPhone handsets available for sale. What’s the difference between them? Check out our quick overview below. This is the current top of the line iPhone, the biggest, best and fastest of the lot. It’s got lightning fast hexacore processing, 4 GB of RAM, a massive 6.5 inch Super AMOLED display with 3D touch, and a fantastic dual 12 MP rear camera. This is the best iPhone around! This is the Max’s little brother, for those looking for something a bit smaller. You still get hexacore processing, 4 GB of RAM, and that dual 12 MP rear camera. But this time the Super AMOLED screen is a more manageable 6.1 inches, but it’s still got 3D touch. This is the 2018 budget iPhone release, slightly cheaper than the XS models. You get hexacore processing and 3 GB of RAM this time, along with a single 12 MP rear camera, and a 6.1 inch LCD display with 3D touch. The 8 Plus was released in 2017 and is a great buy even though it’s an older model. You get hexacore processing and 3 GB of RAM, a 5.5 inch LCD display with 3D touch, and dual 12 MP rear cameras, making this phone a great mid-ranger. The smaller of the 2017 iPhone models, the 8 is also a great bargain. There’s hexa-core processing and 2 GB of RAM, so it’s still speedy. You also get a 4.7 inch LCD screen with 3D touch, and a single 12 MP rear camera. This is the larger of the two 2016 models still on sale, and it’s a great option if you’re on a budget. You get quad-core processing, 3 GB of RAM, a big 5.5 inch LCD display with 3D touch, and awesome dual 12 MP rear cameras. So the 7 Plus definitely still ticks all the boxes! Finally, the cheapest iPhone still on sale is the smaller of the 2016 releases. You get nice quad-core processing power and 2 GB of RAM. Plus there’s a 4.7 inch LCD display with 3D touch, and a single 12 MP rear camera. But if you’re on a budget this could be the phone for you! Apple phones do not have SD card slots, so you can’t add any extra memory to them. Instead, each model comes in different sizes, with different amount of internal memory, more memory being more expensive. Both XS models come in 64 GB, 256 GB or 512 GB models. The XR comes in with 64 GB, 128 GB or 256 GB. Both 8 models get either 64 GB or 256 GB. And the 7 models both get 32 GB, 128 GB, or 256 GB of storage. There are tons of reasons to invest your hard earned cash in an iPhone. Firstly, they have great looks, with stunning design and excellent build quality. But they also perform well, with great power specs. Then there are the extras, like useful voice assistant Siri, or the 3D touch screen that can tell the difference between you touching and you pressing, or the dual rear cameras seen on the upper-end models. And Apple’s iOS operating system is so intuitive and easy to understand that even a child can use it in minutes! If you’re looking for an awesome phone, then you’re looking for an iPhone. 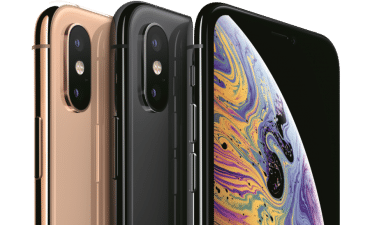 And if you want to know who’s going to give you the best iPhone deals, then check out our comparison tool and know that you’re getting the best phone at the best price. Shopping for an iPhone can be an expensive and confusing business. But we do have some tips that will help you on your way! You’ll need to have a photo ID, be over 18, a UK resident and have lived in the UK for at least 3 years. The process can take an hour or so, but once done you could be paying as little as around £55 a month for your new iPhone. If you choose to get your iPhone with a mobile operator and get a phone plan at the same time, then ensure that you’re getting the right amount of texts/minutes/data. If your plan is bigger than you need you’ll be paying for things you’re not using, if it’s too small you’ll be stuck with extra payments when you go over your limits. You can easily check your usage by checking out your old mobile bills. On a similar note, watch out for your data usage. Data is the most expensive part of a phone plan, so ensure that you’re not getting too much since that’s likely to be costly. You can easily cut down on data usage simply by using WiFi wherever possible (and for most of this is possible at least 50% of the time if not more). Mobile operators tend to save their best deals to lure in new customers, which means that switching over to another operator could mean bigger savings. Switching networks isn’t as complex as you might think, and you do get to keep your old mobile number, so don’t worry about that. If the best deal that you find is for new customers with your current network then you have the option of taking out a new contract with them. Unfortunately, this means that you won’t be able to use your old phone number. You do need to be a little careful with the cost of a phone contract since operators are allowed to raise prices. OFCOM allows UK operators to increase monthly costs in line with inflation as long as they warn you first. So don’t ignore any mail or texts you get from your operator, just in case they contain info about new rates. For the most part, UK operators have fairly similar and very good coverage across the UK. However, there are always exceptions. You should always check that a network gives you coverage in the places where you spend the most time. You can do this from the operator’s website (look for their coverage checker), or by simply asking around your friends and family to see if anyone successfully uses that operator in your local area. If you’re currently with a mobile operator and are nearing the end of your current contract, you can always try haggling with them. Calling customer service and saying that you’re thinking of cancelling your contract can mean that you get offered a discount on a new contract. This doesn’t always work (and tends to work more successfully via phone than in person at a store), but it’s always worth a try. For most users the cheapest option will be to buy a phone upfront and then sign up for a SIM only plan with an operator. Of course, this does require you having enough money to buy the phone up front. But if you do, you’ll get long term savings. SIM only phone plans are cheaper than plans that have phones included, and many are month-long contracts so you don’t get locked into a longer-term deal. You can also avoid a credit check if you get a pre-paid SIM which carries the moniker no credit check SIM only in today's market. If you already have a SIM only contract and buy a phone you may need to have that phone unlocked by your operator in order for it to work with your SIM. You’ll need to check with your operator on this, and it may cost you a small fee. More storage costs more money, whether you’re buying up front or via a phone contract with an operator. So go for the lowest storage option you can to get savings. Remember that there are tons of cloud storage options, and Apple even gives you 5 GB of cloud storage with your iPhone. As long as you’re careful to regularly delete large downloads, and to port your music and photo collections onto a cloud service, low storage options should be fine. Do be warned though that since iPhones don’t have SD card slots you cannot expand storage should you need more. A good way of financing an up front buy is to sell your older phone. There are various ways to do this. Some operators will buy old phones, as will some high street stores. You can always try selling online, and there are specific websites that specialise in buying older models. Selling your old phone over eBay or to a friend should leave you with more cash to buy your new phone. Simple. Getting a second hand or refurbished iPhone can be a great way of saving money. Second hand phones tend to be cheaper, but you do run the risk of something being wrong with it, so make sure you test before you buy. Refurbished phones have been returned to an operator or to Apple to be checked over, so they tend to be a safer bet, though they can be more expensive than simple second hand models. You can find refurbished phones through some operators, through Apple themselves, or even online. Having insurance that covers your phone can be a great idea, especially if you’re the kind of person that’s likely to lose or damage an expensive iPhone. The choice to have insurance is really yours, but with models costing over £1000 it could be a smart move. However, you do need to be careful when buying your phone, since some companies will automatically add insurance to your purchase or contract. Read the small print of any contracts carefully and be sure to opt out of insurance if it’s possible and you don’t want it. If you can’t opt out, be sure to cancel the insurance through the insurance company ASAP. You can sometimes get cashback deals on iPhones, either through websites or through retail stores. These deals aren’t as common on iPhones as on other models, so you’ll have to look carefully. Cashback websites are usually third party sites, so do be careful to check the reputation of a site before signing up. Retail store cashbacks can be very complicated and often require you to send your monthly bill to the company for a set number of months. Be sure to check the terms of any cashback offer before counting on getting that money back. iPhones do use nano-SIMs, the smallest available SIM card. Make sure that you have a nano-SIM to put into your new phone (especially important if you’re shopping online). If you don’t have a nano-SIM your operator will supply you with one, but there might be a small charge. Finally, an iPhone is a big investment, and your personal data is sensitive. That means that you need to think about protection. You phone itself should have a screen protector and probably a case too. Your data should be backed up. And you should always use the security services of Apple, including fingerprint recognition and facial ID to ensure that your data is safe!